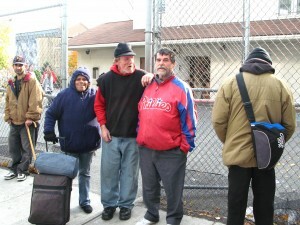 Homeless at St. Francis Inn, Kensington section of Phialdelphia. They were given new socks by The Joy of Sox. Moose, Will, Nate, Eric, and the Man on Crutches and many others all have stories to tell about socks. 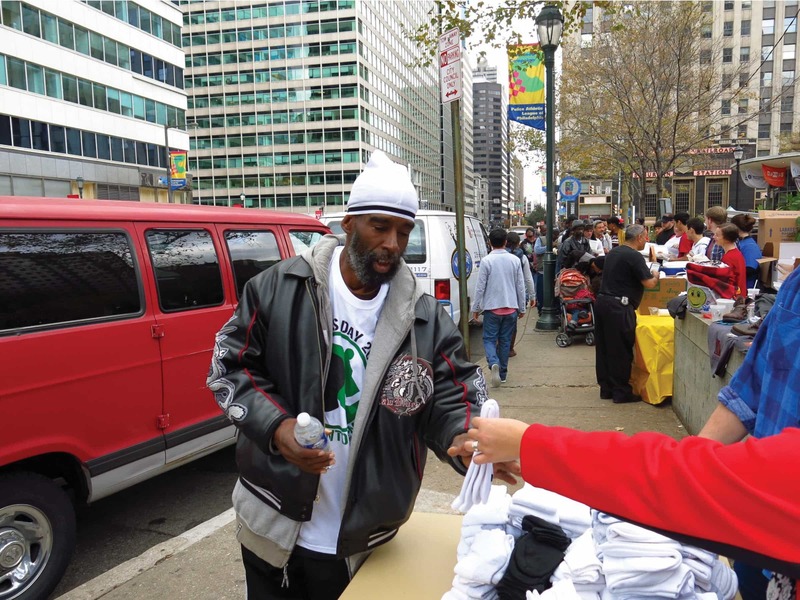 On this page we’ll relate stories from street about the importance and necessity of socks for the homeless. You are encouraged to sent in your stories from the streets. Please use the contact form and select Stories From the Streets as the subject. Whenever I saw a homeless person I would get really nervous. I would cross the street to avoid them. I never made eye contact. Then my wife literally dragged my to a “soup kitchen” one year so we could “give back.” Other than a series of mild panic attacks I survived the experience. But I must admit that as soon as I got back into my car I locked the doors, let out a sigh of relief and felt my blood pressure s l o w l y go down. Fast forward two years. I visit shelters all the time. I talk and eat with the guys (mostly guys). I am planning to hold a class on sensitivity training in dealing with the homeless (all the credit for this should go to Stephanie Sena). Moose is a friend on Facebook and he lives in San Antonio, Texas. I was speaking to him the other day on the phone and he said, “You know what? Whenever I go to a distribution place to get some clothes I may get a pair of jeans, a shirt, a sweater, but we never get any socks.” He then went on to say, “Bless you for what you do.” And he called me Brother Socks. The other day I was at a shelter in Philly around lunchtime. A fellow walked in and looked around. Both Gerry (a friend) and I made eye contact with him. We both said hello and went up and shook his hand. I said “Hi, my name is Tom.” He shyly said “My name is Nate.” Well since Nate was wearing a Phillies jacket I asked him about what he thought of the team this year and what did he think of the pitching staff. We did small talk for a few minutes. He then said he was hungry and started to walk over to the lunch line. But as he was walking away he turned back and said, “Thanks guys for not looking through me today…you gave me dignity.” The power of a simple hello. Eric presently lives in San Antonio. He is also a follower on social media. His church (thank you Brian Wicks) gave him money to take a bus to New York City to reconnect with some family. Unfortunately that never happened, but he got some bus fare to Philly and called me on a borrowed cell phone. I met him at the bus depot. He got in my car and we drove around – a mini site seeing tour. He never stopped talking. Then I asked him if he was hungry. He said he hadn’t eaten since yesterday morning. Since we were in South Philly we stopped at Pat’s Steaks. I think he set a record consuming the cheesesteak. We drove back towards Center City and I gave him a duffel bag filled with about 300 or so pairs of socks for his church in Texas. He was so grateful. But the didn’t want to hang around the street with a bag of really valuable socks so he decided to head back to Texas. Brother Brian sent some money on his debit card for the ticket. We gave a hug. Brian called me a few days later to say Eric got back OK . Eric is in San Antonio looking for work. He’s pretty good with computer stuff (he’s an Apple guy), but it’s almost impossible to get hired when you live on the streets.